A sudden cough from behind them startled the pair, and Boss Panda poked his head through the entrance curtain at the door. “I think we ought to go and visit the brewery” he told them. “Oh good!” said Miko-chan. 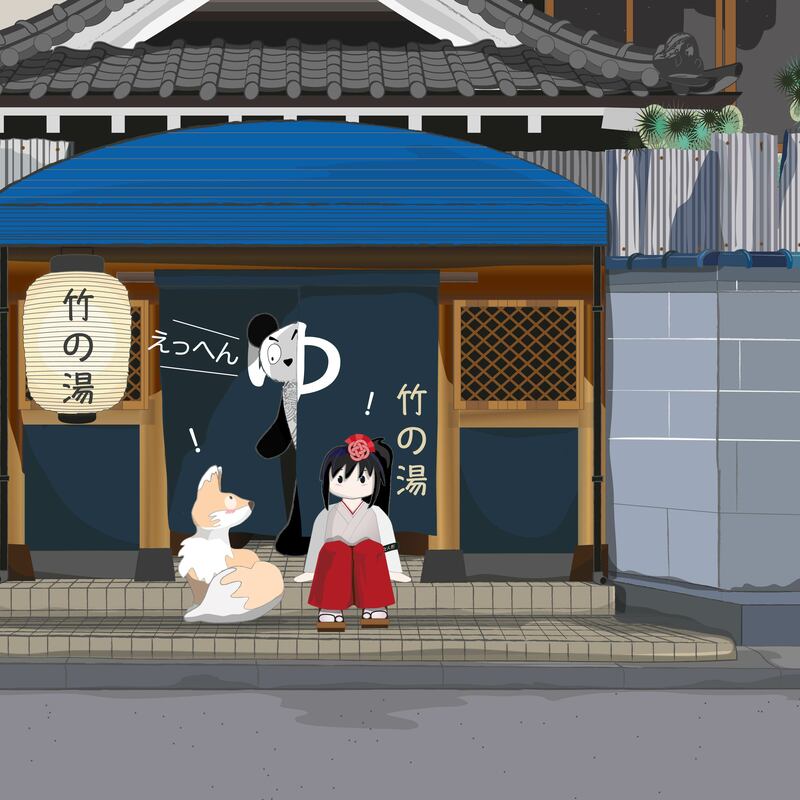 She had once been frightened to go to the nearby sake brewery owned by Boss Panda and run by the slightly gruff Toji Tanuki, because she knew that the brewery workers or kurabito were kappa, and she was scared by the stories about them. 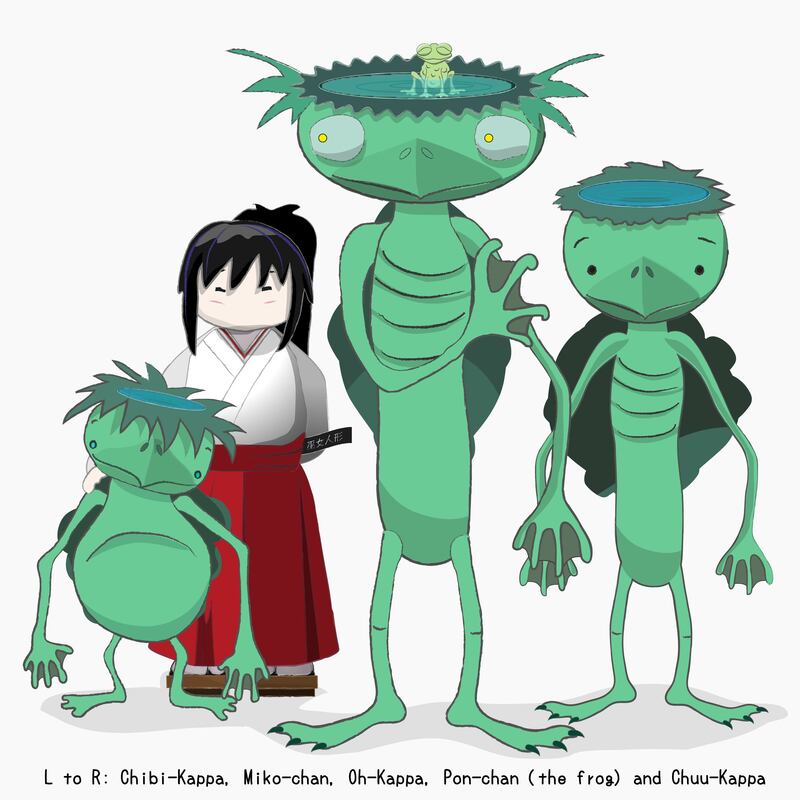 But she now knew they were shy but friendly creatures, and she got on especially well with the littlest one, Chibi Kappa, who was cute and curious. The three friends set off later that day, and were met at the door of the White Crow Brewery by the chief brewer, Toji Tanuki, who looked as though he had been expecting them. He was standing under the sugidama cedar ball hanging over the entrance – still green, showing that the new sake brewing cycle had begun. 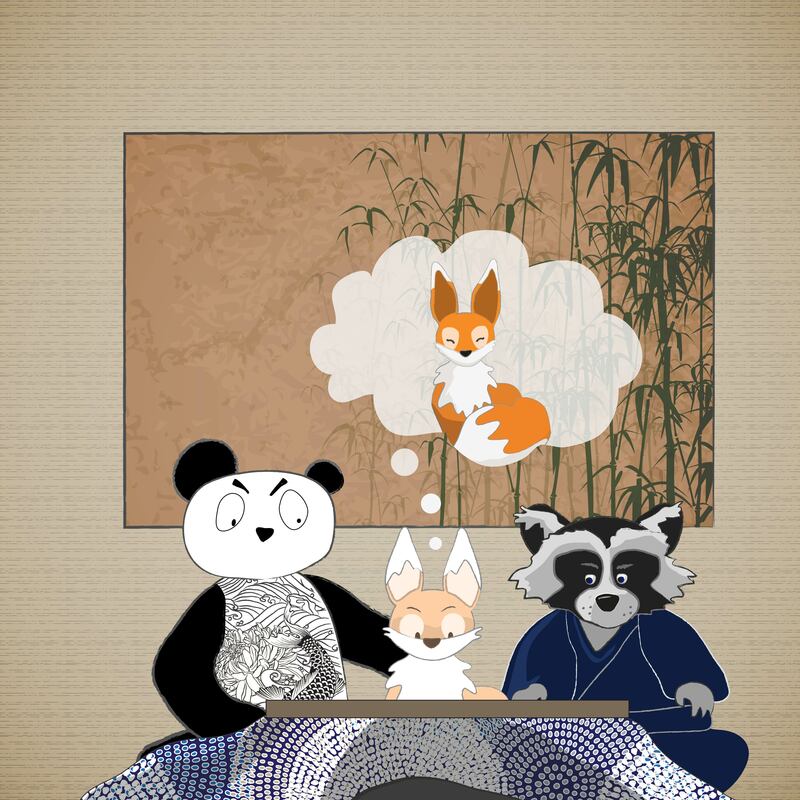 The old tanuki exchanged glances with Boss Panda, and Kiku felt as though his fur had begun to tingle. 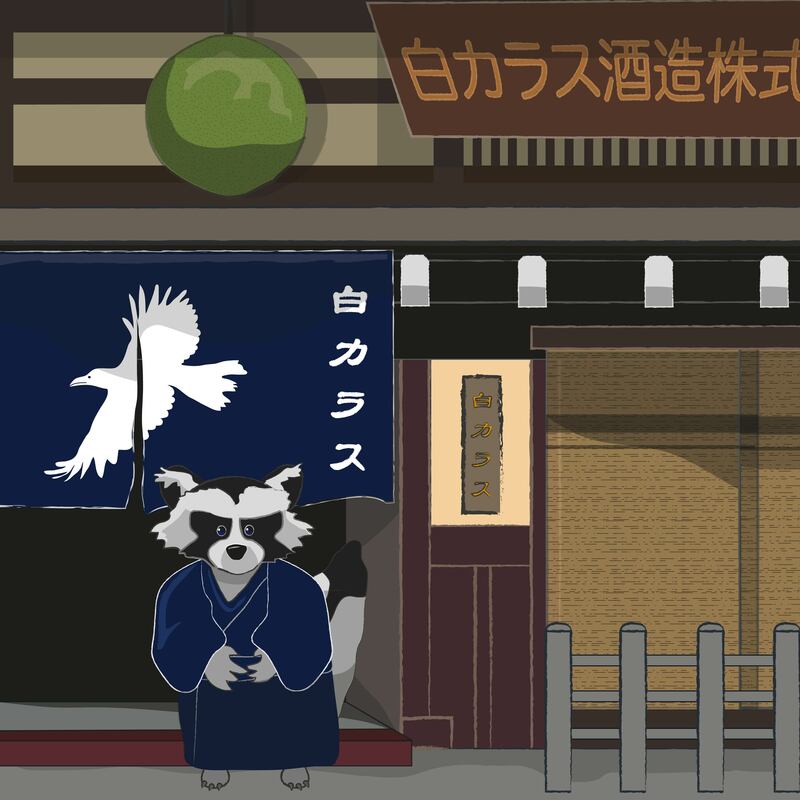 Miko-chan ran off to see Chibi Kappa as soon as they entered, and the tanuki led Kiku and Boss Panda through into a tatami reception room to the side of the building. Chuu Kappa entered with a tray of green tea and sweets, and set them down on the table, giving a little encouraging smile to Kiku as he left, who was beginning to feel a little worried. Boss Panda cleared his throat, and said gently “we thought that the time had come to tell you something. We weren’t sure that you would stay when you first turned up a few years ago, but once you had met Mama Kōjin at the enoki tree, you seemed to be determined to fulfil what she asked of you, in learning more about Japanese customs and the importance of the seasons. You have also become a good friend to all of us, and especially to Miko-chan”. 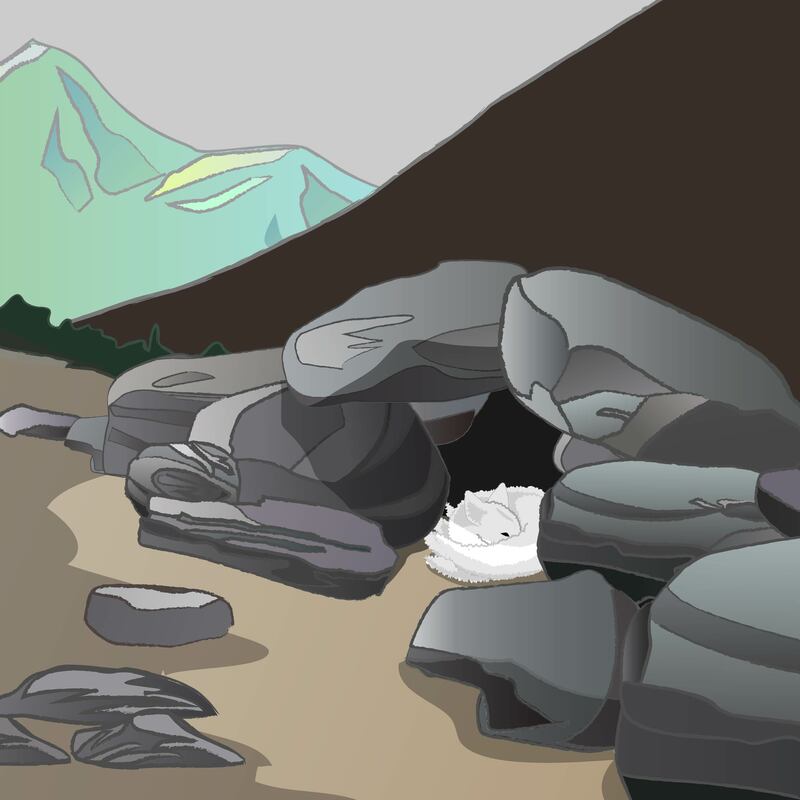 The little fox nodded solemnly, and said “When I first arrived, I wanted to know more about the country that my mother and grandfather seemed to know so much about, and since her death, there was nothing tying me to England. In fact,” he continued, “I must admit I feel especially at home in this country”. At this point the tanuki (who had never said much to Kiku before) asked “did you ever wonder why your mother knew so much about Japan?” Kiku shook his head. “I thought she had learnt through stories told by other foxes, although she did seem to know so much…” he paused, remembering with sadness his mother’s kind face. Kiku sipped his green tea, a flavour that had always appealed to him, and thought back to the tales his mother and grandfather would tell him about shrine foxes and magical foxes with nine tails, and the strange pull he felt to find himself a role in this country halfway across the world. Far from feeling angry at not being told earlier, he was pleased that he had been allowed to get to know people on his own terms without the added mystery of a missing father. He had begun to put down solid roots in Tokyo, and felt confident that this new piece of the puzzle could be solved with the help of his friends, and he told the old Panda and tanuki that. They looked relieved. “Although we don’t know much more to tell you at this point, we are hoping that we will be able to find out where he has gone,” said the old tanuki, who was now looking at Kiku with more fondness than he had ever shown before, “with your help and permission of course.” Kiku nodded. Oh I am so hooked! Especially since I finally figured out how to find the stories? Hi Melanie – thanks for your comment, I’m glad you’ve found them! Reading this was the perfect start to the new year. So good to be back with Kiki and friends. 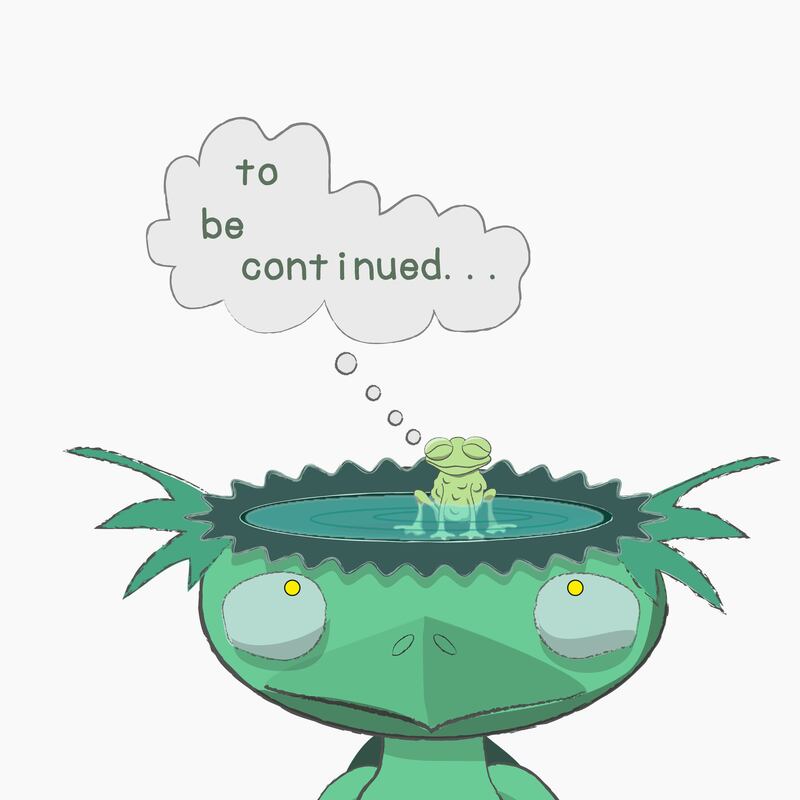 Such an intriguing story is unfolding here—can’t wait for the next installment! Hi Jennifer – thank you! Hopefully there will be more to come before too long!